Below is the full transcript from episode 1 of Hedgeye's In The Arena podcast. In this inaugural installment, host Daryl Jones is joined by his old friend, Hedgeye Founder and CEO Keith McCullough. They discuss how Keith got his start on Wall Street, his interview at Lehman Brothers, jean shorts, his biggest challenges, wins, losses, the critical importance of macro and much more. Daryl Jones: Hi, I'm Daryl Jones, Director of Research at Hedgeye, an independent investment research firm focused exclusively on generating thoughtful and actionable investment ideas for institutional money managers. You’ve likely heard the quote before, but we embrace Teddy’s words as we grind daily to produce research that finds the truth in the markets, not just echoing the lazy or consensus narrative. We don’t pretend to be the smartest guys in the room and we make our share of mistakes. But we love the debate, and the opportunity to help our clients play this most interesting and challenging game at the highest level. It is our worthy cause. This podcast will give you a glimpse inside our locker room, to get to know our team, our failures, our wins, and most importantly, our investment processes. 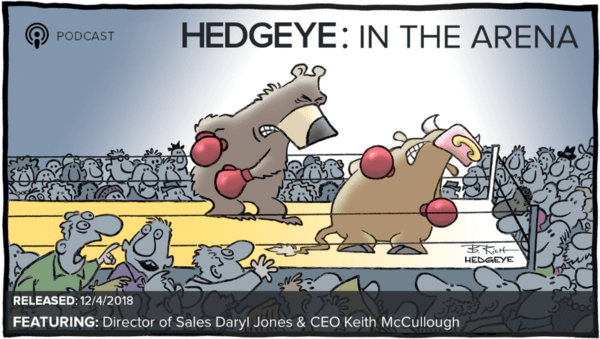 Welcome to Hedgeye: In The Arena. All right. Welcome to the first episode of Hedgeye: In The Arena our biweekly podcast. I'm joined today with Keith McCullough, our CEO and a gentleman that's been my friend, teammate, etc. for over 25 years. I thought before we got going today, we set the stage for the first time we met, if you've been following Hedgeye at all, you probably know that it was at Yale and we were both knucklehead hockey players. But I was a year ahead of Keith and the year before Keith came in, we had probably one of the worst years in Yale (hockey) history. So we knew that we needed to beef up our team, especially our scoring prowess. We heard tales of this top scorer from the Ontario Junior Hockey League, Keith McCullough who was coming in. (Although) we never met him, he actually had a bunch of classmates that were very highly touted as well. So we are of course quite excited for this influx of freshmen to help our team and they eventually did really help turn our team around. But the first time I met Keith was in the weight room and he came in in a tank top, cutoff jeans, probably black high tops and you know, we're sort of looking at ourselves and wondering is this guy really going to help take us team to the next level? Eventually he did, and what bloomed between us was a long-term friendship and business partnership and now here we are 10 years later. So I think with that, maybe we can sort of start from the beginning, how did you actually end up at Yale, where we met and of course we met Michael Blum as well. Talk about your path because for you it's obviously not traditional for you even to necessarily go to university, let alone go to a great Ivy League school. Keith McCullough: Yeah. Being from Thunder Bay, Ontario, you know, being from Alberta, it's not exactly a direct shot to an Ivy League school. In fact, no one in my town had heard of Yale. I'm sure they did, but nobody had actually gone there. So it was an indirect path, but all I did was I left home when I was 16 years old to play hockey 20 hours away from home by car. I played and played and played until somebody finally wanted to offer me an opportunity to play on their college team. So like any other college recruit, you get different options and I was lucky enough to have Tim Taylor (former Head Coach of the Yale Men’s Hockey Team) recruiting me. I remember that game in particular, the game that he came to watch me play in Hawkesbury (Ontario), he saw me get into a fight. He was hoping to watch me score and I get in a fight - so it was a little bit of a bump along the road, but I've had many. Luckily, I ended up being recruited there (Yale University) and then found my way to New Haven (CT). Daryl: So you get to New Haven, obviously for you just like me, it was a bit of a culture shock and a learning curve in many ways, setting aside the hockey. I kind of know a little bit of your academic history - every year you get better grades, better grades. But at what point did you decide, in terms of a career that you wanted to get into finance and go to Wall Street? Because I think for you, just like me it wasn't even something you would have considered prior to going to Yale because nobody, you knew worked in finance. In fact, we've talked about our parents to this day probably still don't understand it. Keith: Exactly. And that's a good point. I mean, I didn't know. The only thing I knew about Wall Street was that's where the money was. And that was pretty much it. I mean, I didn't know until effectively I had my first internship, working for a guy, a fellow hockey player, hockey alumni. Tiger Williams gave me an opportunity to be an intern on his trading desk and that opened my eyes to so much what Wall Street was all about because I clearly would never know until I got right into it. But it was just the pace, it was the competitiveness, it was everything that somebody like me or you for that matter would be attracted to and that that's what first got me interested. Then I just dove right into it and got really involved in markets and started studying them and trading them and doing all the fun stuff. Daryl: Yeah. And just so everybody has some context here - the first internship on Wall Street was pretty humble beginnings. I think if I remember correctly, three or four of us lived in a one-bedroom apartment that summer. I was about to start my first job. You were doing your first internship and at one point we were out for beers with Tiger (Williams) and he literally sat us down with a napkin, diagramming out how Wall Street actually works. Like, this is the sell side, the buy side, and I think that to me was the first conception of what it really was all about. Keith: Yeah, that was an amazing time. And Tiger told me to just like punch tickets, when hedge fund ABC is shorting this stock, you're going to put in a red ticket and when they're going to buy something it's going to be a black ticket. And then I figured out that was the name of the game, buy low, sell high, and uh, we went from there. .
Daryl: Exactly. So you have this internship which obviously gives you some great perspective. Talk about the interview process your senior year and how you ended up with your first boss job at Credit Suisse. Keith: Yeah. You jump into this interview process. I was probably the most unqualified person in terms of a grade point average, to your point, when I started at Yale. I was a fish out of water, so to speak. I had to work my way up from a grade point average perspective and was happy with how I finished as a senior, but you're interviewing with people that have literally been trained their whole life to get that interview on Wall Street. They have a perfect GPA. They're literally perfect people. And that was difficult. I remember the best interview I had was at Lehman Brothers when they invited us all in a hotel hallway and you just wait for the door to open. They call your name and then you'd go into one of the doors and you'd sit down with some random dude and he just started grilling you. He asked me what do you have here that, that nobody else has. And clearly, I wasn't thinking of some academic standings and I certainly wasn't a about to be a nobel laureate or Phi Beta Kappa or anything. So I just said, I think if you were to take everybody that had been standing out in that hallway for this whole time and put us all in one room, turn off the lights and throw a ball in the room, then I come out with the ball and he didn’t quite know what to say about that. And I actually didn't end up working at Lehman Brothers, Thank God. I ended up choosing Credit Suisse. It was another great guy, a Yale basketball captain by the name of Steve Keller, who hired me. He was, of all the luck that I've had in my life and all the blessings along the way, he was just one of the other great guys that I've met that took me under his wing and actually had an interest in me learning and helping me kind of grow up on Wall Street. And he certainly did that. Daryl: Your first job was basically as a salesperson or a junior sales person initially, and then you worked your way up. What was that like? This was Credit Suisse, when the internet boom was at its peak. There's every kind of company in the world – it’s sort of like crypto or marijuana now, every company in the world is transitioning to becoming an internet company. Most of them had no business plan, but what was that like? Just kind of being on that trading desk in the epicenter of really the financial world. Keith: It was amazing. I thought that that's what Wall Street was all the time, you come to work and everything goes straight up and to the right. I was in the Credit Suisse junior analysts/sales programs, is what they called it I think. Luckily, I was on the desk where Frank Quattrone who is at the time just the haymaker or rainmaker rather, eventually became a haymaker I guess too, but of Wall Street where he was just issuing new IPOs day after day after day. My experience ended up being, I had to stay for as long as I could. You get free dinner by the way, if you stayed past a certain hour and I didn't have any money, so I'd always do that and then I’d come back upstairs and I just flipped through all these reds. These reds, if you will, to explain to the clients or summarize what the heck it is that this next company that was going to open up 20, 40, 90 percent on the open, what it actually did. For the first six months of my life on Wall Street. I was just churning and burning through all these different IPO prospectuses and trying to help clients understand what they did since they didn't know. I guess it put me on somewhat of equal footing and it made me realize pretty quickly that if you just outwork people, you could have that step ahead and actually staying after dinner if only for me it was free dinner was actually my extra leg up at night so I was always prepared coming in in the morning. Daryl: So then you're at First Boston for a couple of years, and if I actually remember this correctly, what happened was you reached out to me about a job with one of your clients, Dawson. It was for me to be a junior software analyst and because I was at JP Morgan and interviewing you introduced me. I ended up getting an offer and I think they go through the process, turned around and said, well why don't you come interview two and come on board at the same time that if I recall, it's kind of how it worked, but you know, talk about that process for you and why you decided to go to the buy side after the-. Keith: Yeah, it was all part and parcel, you know, my role at that time on Wall Street and Wall Street's all about when you get there. You know, it's all about timing. Timing matters we like to say still to this day and always will. But again, a lot of our clients, we're adding a lot of value because we're A) making them a lot of money and B) just flying through all these different IPOs. So what ended up happening was a lot of our clients just end up offering us opportunities to work on the buy side. So, you know, I covered Steve Cohen, we covered, you know, Pequot Capital, which ultimately split off into what was called at the time Dawson-Giammalva and John Dawson obviously offered me a job as an analyst. Whereas a couple of the other places offered me jobs that were a little different maybe on the trading desk, whatever it may be, but he was the one guy who said, look, you could be really good analyst. I don't know how long it's going to take you and I'm going to start you with like the easiest group to follow, he gave me the retailers, and that's how I got my shot. Daryl: So talk about, this is probably at this point, 18 years ago or maybe a little less, but what was doing research like then? I still remember our small office, I think you and Russel sat in one office, I was with Jeff and another guys. Tom Tobin who works at Hedgeye now was also part of that team, but the research process was very different back then. This was actually pre Reg FD, pre a lot of technology advancements you have now, but maybe talk a little bit about how you did research then. Keith: I mean at that point we just got the internet for God's sakes. I mean, so it was very different. I'd say that it was fundamentally grounded in just doing the grind, reading through K's Q's, doing all the research, then meeting with the company, then building out your model. Then saying, okay, I think that we should buy this or sell this. That is effectively what it was. We were all stock pickers and I think to this day that's actually a huge opportunity in understanding what the Old Wall Street hedge funds were versus what you need to have evolved to. And obviously understanding fundamental analysis matters but I think the game has changed tremendously since then. We're quite lucky to come into the game at that point because I think the game was a lot easier. To your point, you know, you do a lot of meetings and have a lot of information in the era of non not information effectively the nonproliferation if you will look at it. Daryl: Back then before Reg FD existed I think the type of information you get from companies is probably of higher quality and the other thing is typically institutions were the only people that had access to these companies as well. So the one on ones in theory actually did have an impact and it's almost what you would pay the street for back then. The research itself was pretty much meaningless other than maybe getting a call from an analyst, but you know, the access you really tried to get to company meetings. Keith: Yeah. when John Dawson made me a partner early, I'd argue almost too early, one of the first things he said was you did 256 one on ones with companies last year. Keith, that is awesome. But all that means is that you don't have a life away from your job. I mean, you don't have a family clearly, you're not married and if you were, it wouldn't end in marriage. I just traveled all over the place and just grinded and grinded and grinded. And that really was what the game was about. Daryl: So at a certain point you become a partner at Dawson, you're doing quite well. You launched your own fund, I think it was Discovery, sort of named after Captain Vancouver's boat. I remember some things. So you have this platform, you launch a fund on this great platform that has a very compelling history. You hire Harry Schwefel, but at some point you and Harry decided to go out on your own. What was sort of the thought process behind that? Keith: Well, at some point, for somebody who left on their own to be on their own, to make it on their own when they were 16, you knew by the time you're 26 or 27 that that call is knocking around in your head. So I was always going to go on my own, the question was when. It had nothing to do with the people that I worked with or the platform that I was on or me being unhappy. I was obviously compensated way more than my wildest dreams could have ever imagined. It certainly wasn't about the money. It was just about wanting to start something with my own name on it and start something like we have today. And Hedgeye is something that's built on my own principles, where I live or die by my own sword and have the real skin in the game. And I made that decision. And I was fortunate enough to have Harry, back then he was my analyst and now he's gone on to be wildly successful, he's the CIO of Point 72. It was a real important and formative time in my maturity curve, working with a guy like that super talented and just having an opportunity to just go open up our own firm. Daryl: So you and Harry start your firm, eventually decide to sell it. Probably to some extent it's a scale thing at that point if you can't scale you're better off being part of a larger platform where they'll give you capital, you can kind of run it on your own. But then eventually you guys decided to part ways and you end up as part of a new launch at a major private equity firm. Maybe talk about why you decided to do that and then how things unwound. Keith: Well all this, I mean I was again lucky in terms of timing. I mean I came into Wall Street during the internet bubble. I was building a hedge fund during the hedge fund bubble. So the hedge fund bubbles was clearly 2006 and 2007 into the market peaks. So in '07 or '06 rather, when we decided to take what we built up, it was called Falconhenge Partners and just basically rolled into Magnetar Capital, Al Litowitz and Ross Laser's firm in Chicago. It was just the money was too big to ignore and it sounds like an absurd or an incomprehensible thing to say because the money just made you make the next move. And to me, and I wrote a part of this story in my book was that when I ultimately went to Carlyle, I mean they were offering me partnership and the best job that I thought I'd ever get my life and a lot of money, beyond a lot of money that we've already been making. So that was really kind of the shiny rock on the hill. And little did I know that it was going to be a shiny rock that turned into being a little bit more like a Sisyphean fight. Daryl: So Carlyle, you know, the idea made sense. You have this large and successful private equity firm, they effectively start a multi-strategy hedge fund, but they effectively, to your point, did it at the peak, but what actually brought down that fund, I mean this is all public. Keith: Yeah, it's public. I mean it's not, the Carlyle Capital Group in London was publicly listed, so that's clearly public and they blew up and went away and so did our credit guys. I wasn't the credit guy, but unfortunately that didn't matter. Like to your point, when you have a multi strategy hedge fund, it's called a master feeder fund, everybody gets paid on the same P&L. And here was not going to be a P&L or we're not going to get back to your high watermark for years to come because they'd lost so much money and so systematically one by one, people were getting fired. And I ultimately, like a lot of people, had just started there six months ago. I was actually going quite bearish on the market in the summer of 2007 when this was all going down. Keith: Bearish obviously too early by a couple months. And then by the time I got fired, I got fired on November the second I'll never forget and it's easy to remember because my son was born on November the seventh of 2007, and it was a real jarring experience. You go from, like I said, the shiny rock on the hill, one of the greatest partnerships in Wall Street history in Carlyle, as your opportunity that you've been telling everybody about it for a year. And I broke up with a wonderful partner to take it because they only wanted to take me. And lo and behold, six months later the whole thing is over and I'm on a train with a box with all my stuff - my notebooks, my shoes, and everything else. Jarring is actually an understatement. Daryl: So at that point, it's sort of interesting - you have your first son, your career is at a bit of a crossroads. You obviously had this tremendous run for 10 years, you know, there's a fork in the road. You can either probably go back to another top hedge fund, run a book or do something on your own. I assume is what you were thinking at the time, what made you take the path that has now become Hedgeye? Keith: Well, as you know, being a father now, there's an existential component to having a child. You have a child and I had that child, thank God at the same time that I got fired because everything that I never thought about I had to think about at the same time. Which has to largely do with what do I want my future to be and most importantly what I want his future to be and my wife Laura's future to look like. And the number one thing that I kept coming back to is that under no uncertain terms or any conditions, am I ever going to work for anybody ever again. So that was the only thing that I had in my head. Now I had a noncompete so I couldn't go to another hedge fund, so that made it easy. Daryl: You would have been on the beach for a year or something like that. Keith: And they pay you to do that and whatever, but what the real thing that I wanted to do was just do it again by myself and I just spent the next three months trying to figure out what the next big thing could be that I could do that really was new and interesting and exciting. At that point I was quite stressed out. There's no amount of money that you can make that can get you to that level. Don't forget when you go to a hedge fund and it's a multi strategy hedge fund with multiple PMs, not everyone of your teammates wants you to do well. And that was a very odd environment for me. Daryl: Because you're basically competing for capital. Keith: Exactly, competing for capital. These are the things that are just not me. I love being on a team, I love being the grinder on a team. I don't care if I'm scoring goals or not scoring goals, I don't care if I have to get into fight or if I don't get in a fight - I want to be on a team that I can trust and that's really no matter what I did, that's what I wanted to do. So that's what I started with and Hedgeye as kind of built, not kind of, it was explicitly built on those principles. Keith: And editing it because you were embarrassed for me probably because of my inability to write. Daryl: Right, writing goes a long way. You lose your job, but you're getting paid to stay on the beach, so the stay in tune with things you continue to trade and continue to do your morning note and effectively send your morning note out to your close contacts on Wall Street and that in a way is how Hedgeye was born. It seemed like the idea of what it could become kind of crystallized in your mind, but then the next step of course was picking the team members. And so how did you go about that process? Keith: I mean there's a whole string of things happened and again, they happen in order for a reason. So I'd always, when I was at Dawson, I'd always been trained, as were you, to write investment memos on our positions and why. So I was big on communicating. Not a shocker here, I was big on transparently communicating and being accountable to my positions, what I thought and why, what the catalysts were. So to start writing what was called that MCM or McCullough Capital Management blog, which you can go back to. And again, apologies in advance for my inability to write coherently back then, but I was just effectively writing about my personal account and not pushing my own book, just telling you what I'm long what I'm short. And lo and behold, writing about what it is that you do started to become interesting to people, including my own friends and always thank you for that help. But it wasn't just my friends, it was my colleagues, it was people in the hedge fund industry that knew me, that wanted my ideas. And they said, look, we would pay you for these. And since I was looking for some work that wasn't running a hedge fund because it wasn't allowed to, I started thinking about, okay, what would be a subscription based business model that allows me to do what I'm good at and build something that I enjoy doing. Like I love reading and writing as you know, and Hedgeye literally started with reading and writing and putting my own scratch on the line. At that point, Laura and I and my new son don't pay for diapers or anything else unless I make money in my personal account, don't forget. So it all started with, where everything's always started with me in life, which is you either figure it out on your own and you make it or you're not going to make it and that's going to be it. There was an existential nature to that situation as well. So boom, all of a sudden, here we are. It wasn't just the internet at this point, it was Twitter, it was YouTube, all these communication channels. And that was totally opening up my world to being ultra-transparent. And that was the beginning of founding Hedgeye. And to finish off the last part of your question - then I just thought of: who are the people on Wall Street that I had the most respect for in terms of their ability to make money, number one, and number two, their principles? Obviously, you can find good friends in life that have great principles, but they can't make you money. Those two things are what I found in people like Brian McGough, Howard Penny, Todd Jordan, yourself. These are all people that can help the team win. That's probably a better way to put it than just make money. It's not just about making money in this case is about finding a team that can help you be successful at the highest level and having those people be the same people that when push comes to shove, they're going to be sitting on high moral ground. They're not going to be questions in terms of their integrity, their credibility, etc. Daryl: So we're going to get into the investment side and the investment process. But first I just want to ask about when the company was started, it was a handful of people, five, six, seven, eight - it's now over 80. What do you think you've learned in terms of management over that period of time? What's been the biggest challenge and the thing that maybe you figured out that you're really good at in terms of the last 10 years? Keith: You mean in terms of like actually managing the company? Daryl: Yeah, actually managing the company so more the business side versus the research and investment side. Keith: Well you figure out in a very short period of time, in many, many ways, painful times what you don't know. Being a manager of a P&L of the company is dramatically different than analyzing the P&L of companies and trading those companies. So this is like the greatest, at least at this part of my life, the greatest lesson that I've ever learned is having to learn how to build a company, having never known how to run a company. I struggled in a lot of different ways. I think a lot of ways that people do. One good example is outsourcing. I outsourced our software development team because we're trying to build this next generation platform. Effectively, what we built was a content platform, so how do we publish and produce all this content and make it look anything but what Wall Street looks like. So you have to have engineers build that for you, you have to have software engineers and we outsourced. And they just couldn't give me what I wanted and most importantly, or what I thought I had in my head is the vision of it. And more importantly, they weren't accountable to that. So, wasted a ton of money of my own money obviously because we started the firm on money. We never had an outside investor fund the company or anything like that. There are a series of things like that, like how to manage HR, how to know that people that work for you may not want to see all the principles that you see as being the most important. So once you figure out that someone is not principally oriented with how you want to run the business and you want to get rid of them. How do you do that? I struggled with that. I remember the first couple of people we had to let go, you know, these are the kinds of things that you just like actually lose sleep over. It's kind of a term people like to say, which is, you know, what makes you lose sleep at night. I don't lose sleep at night, unless something really jarring, that I've affected had to occur, which is in that case, firing somebody. So having a process for that, having a process to generate evaluations on compensation, there's a tremendous amount of things to do. Compliance, thank God for Moshe Silver who was one of the early partners of Hedgeye. He was also one of the heads of compliance at Carlyle, one of the best hires of all time, one of the best partners in Hedgeye history. You learn how quickly that somebody that you brought on that you thought would be a good teammate ends up being a great teammate, so you know how to value the right people in the right situations. There's so many things. I mean I could talk about that forever. Daryl: Getting into the research side. Obviously macro is the largest business at Hedgeye and has been the cornerstone of what you do. Maybe you can just talk - and we talk about this everyday -but high level how the macro process works, what are the key components and how it all kind of flows back into making a call. Keith: Our process should be easy to understand but it will never be easy to execute because effectively you're taking a complex system like the global economy and then you're breaking it down into more and more components of that complex system, that nonlinear system which are the countries in the global economy and then you're breaking it down further into their respective markets, whether it be currency market, credit market equity, commodity market, and so on. So that's effectively what we do. We do that both fundamentally and quantitatively. So there's a two part process that works in conjunction with itself. So the fundamental research process is effectively trying to predict and forecast and nowcast the rates of change on two things, growth and inflation. And then on the quantitative signaling side, it's basically using Mr. Market's signals, basically a price-volume-volatility signal - without giving away the keys to the kingdom that's effectively my core signal, or at least one of my most important ones to signal whether or not you think what you see coming down the pike fundamentally is becoming more and more probable or not. If it's not, then the data is likely going to reflect that the data is going to change and you need to be changing in conjunction with that or alongside that. So I try to be respectful of all the mistakes I've made in the market, which is the market is usually front running you and the market is almost always smarter than you. So let's try to reduce the error rates by getting to the most important components, which is the fundamental research analysis, which is what I started with on Wall Street to the risk management of those conclusions and those positions. And then now that I have all that done with a big team supporting me an d all the data standing behind it, what are the highest probability bets that we can make that Wall Street doesn't believe to be the most probable outcome? So that's effectively how we make calls. I love making a call when something in our model fundamentally and quantitatively is becoming probable and Wall Street still deems it to be improbable. Daryl: I'm going to ask you a two part question. Thinking about that process last 10 years, is there an example of a time where you got something really wrong or not really wrong, but you made the wrong call. Maybe it was a timing thing and kind of what happened in that scenario. Then we'll end it with a time when you really nailed it based on the process or evolution in the process. Keith: I mean to be clear, I've screwed up so many times that you can't even count. Well, actually, we can count them in terms of Real-Time Alerts, so if you want to even look, anyone who subscribes to see. Daryl: I think it's more thinking about macro where I think from my purview sometimes it's having been a little bit early, but I don't know if there's an example. Keith: In terms of big macro mistakes, the biggest one I feel like I made and learned the most from was 2011. In 2011 what happened was, well first of all - all by mistakes come from overstaying my welcome on something that I'm right on and then overstaying my welcome and then I lose so much of what I gained by being right. I mean that to me is the worst kind of mistake because getting into a position should explain, if you understood how to get into it, you should understand how to get out of it. It was accurately bearish it was a well timed call. The market started to break down big time. Utilities were breaking out and bond yields were breaking down. It was kind of a classic call that would work for me. And then all of a sudden Ben Bernanke starts twisting the curve and Mario Draghi's talking about whatever it takes after Trichet made the last policy mistake for the Europeans in 2011. And I just overstayed my welcome on the bear. By early 2012 every market signal I should have listened to coming out of the summer of 2011 was crystal clear in the rear view mirror. And which to your point, every mistake that I make, I'm too late to make the change. And in this case, you could argue I was three months late or six months late, but late is late. It's not on time, it's not accurate. It was wrong. And from that point on, that's when I really started to tighten the screws on the team and on myself on timing matters more than your theories matter. And that's why I believe what I believe today because we took that opportunity to learn what we did wrong, to make the next set of mistakes. From that point I don't think we made [in macro] a gigantic mistake. It's really been an incredible ride and I think it's because we've remained so vigilantly dependent from a data perspective and a market signaling perspective. Daryl: I think arguably, I mean maybe you think differently, but maybe one of the best calls has been this most recent call in terms of transitioning to Quad 4 in the U.S. economy because I think the timing was almost spot on, like literally within weeks. And then it sort of played out with the asset classes. Keith: If I give myself, and I sincerely hope whoever's listening to this has some empathy with this, I mean as a professional who strives to be accurate, you should like a professional golfer be able to tell people when you have double bogeys, bogeys, etc. versus when you had good runs and you made birdies and you played well, but you should also know why you played well. Like did you score well? Did you play well for the right reasons or was that based on luck? And I think this one, you know, this is largely a function of me learning from getting fired in 2007. The two times that I was wrong, that I see again, using the analogy of scoring double bogeys or maybe getting an eight bagger on a hole that's a par three is being too early in 2007. I was down 3.4 percent when I got fired. Some people would say that that's not a disaster but by my standards that's unacceptable. Being too early in '07 going to the bear side and being too late going to the bull side in the middle of 2011. This call, you know, a lot of the time, if I would've worked with anyone that I've worked with in this industry so far and I saw a lot of clients making them this mistake, people that are value oriented obviously would make this mistake naturally, but staying bullish throughout the whole period, you know, coming out of the back half of '16 through '17 all the way up until the third quarter ended the third quarter of 2018. That was by learning one very basic lesson is that you, Mr. Short Seller of a market because it's gone up and it's too expensive or going to wear this mistake for longer than you possibly could imagine. And you know, again, thank God I learned that lesson before because anybody who's been squeezed in an up market at the top and you could have been squeezed in 1999, 2007, 2016 and '17 and '18 should have learned along the way. And all I am is, and I've said it many times so far in this discussion is I'm just a product of the timing by which I have been on Wall Street. So I've seen this movie before, I've seen it in the data before and I just waited, you know, God forbid that the lesson was that I had the patience in the process to wait for Quad 4 or the first rate of change slowdown in growth and inflation, which quantifiably we'd been saying throughout all of '17 and 2018 wasn't likely to happen till the back half of 2018. Anyway, so we waited until September the 27th and again, I don't think it was luck. I think it was probably the best time in my career of the process being right for the right reasons. Daryl: You know, thinking about the process a little bit, how does that flow down into the fundamental sectors because that's obviously the other core of our business, fundamental stock picking. How do the Howard or Todd or Brian, how do they take the macro process and apply it to their second? Keith: Well it as much as everything that I just said, it's a function of timing and experience and now that I've worked with some of the sector heads for going into the second cycle they're getting, they're getting used to working with me and buying into my process and understanding what Quad 4 means. If you hadn't worked with me throughout '08 and into '09 you probably hadn't seen that movie before and you might be an analyst our team that didn't have it embedded in your process as coherently as some of the other analysts did that I've been working with. Todd Jordan is a good example. He covers some cyclical subsectors of consumer, like hotel stocks for example, he incorporated it rather quickly. The sector heads don't start with what is the macro team or Keith's team and Darius [Dale], what are they saying. They should be starting with, what are our views from a rate of change perspective in our industry, what are the winners and losers in our industry? Picking stocks on the long and short side and then using macro to augment their views, not starting with macro. Now, that's from their perspective. From my perspective, I use it the other way around. I start with macro, then I look to them, it's like going shopping in a grocery store. There's a lot of things in here that I could eat and I like food. I like to drink and I like food. I like beer. But, I don't have to drink that beer or that wine I can pick the one that I feel like drinking or eating right now. And that's how I use the analyst team because I know what I'm looking for. In Quad 4 I'm looking for certain things. It's not luck, it's by design - we have a lot of analysts now, so I have more varieties to pick from and the goal would be to have 80 to 100 analysts on our platform where the choices of where I could go to express the macro view, broaden. And for me that, that is the mecca - having the most amount of edge that I could possibly have at the sector head level and at the stock picking level because you can only do better when you have better and better people on your team. Daryl: So let's talk about the industry a little bit. We've said this for a long time, but there's a lot of over-supply on Wall Street, either brokers or funds or sell side firms. How do you see Hedgeye kind of fitting in with all that? What's our kind of key differentiator? Keith: The number one is that we're not the Old Wall. So let's start with what is the Old Wall? The Old Wall is the competition. So to some people I rub people the wrong way on that. And newsflash, I should. If you are on the Old Wall and you're producing research, you are conflicted, compromised, and constrained. Let's just start there. You're conflicted. Conflict of interest, you have banking and brokerage business, you cannot and most of the time constrain, you know, 85, actually probably closer to 90 percent now of research ratings on companies on the Old Wall are buy. Where for us I make our analysts make it at least 50/50. Tell me something you like and something you don't like. The compromise is that you can't tell people the truth all the time and it's an ever-growing problem in the world of increasing information because the media of course uses the Old Wall and its content or their research views as what they consider the written rule of the establishment or the received wisdom. So independent research is in the best place that it's ever been. And it's not just because there's fake news and fake media and compromised political type of views on markets and companies. But it's because that's where we're at. People know that they can find the truth if they look for it. This is the modern era, the modern era of information transparency. A lot of the things that we adhere to play to the independent research space and I think there should be and will be more and more independent research providers. I don't think there's going to be Hedgeye copycats but what we're doing shouldn't be that unique. This is America, we're not living in Sudan. This is a place where people want to know the truth and most importantly they know if they get the truth before the rest of the world has the truth, they make money on it. And that's the thing that ties it all together. Daryl: One regulatory issue that's been a headwind for us this year but I think will be a tailwind for us and the independent research industry broadly is MiFID II, which is the unbundling of trading versus paying for research. Maybe you could just talk a little bit about the impact this year and kind of what you see is the impact of MiFID II going forward from a high level. Keith: MiFID II for those of you that don't know is basically a European regulation that says that you need to itemize what it is that you're paying for as a buysider or as an investment firm and tell your providers that that's what they're going to get paid. In other words, let's take down what we're paying Wall Street because a lot of what we're paying Wall Street is for things that aren't clearly adding value to the investment process. That's great in the long-term, short-term it's a headwind for accounts that pay us as voting dollars, what we call it. We either get paid subscription dollars or we get paid voting dollars. If you're a massive firm in Boston or London or any of the major centers of buyside firms, you're going to see voting dollars go down and subscription dollars go up. I think once again maybe it's good to be lucky, but lucky for the right reasons. We'd always built a subscription model to begin with so subscribers pay the price that we asked for as a subscription and that's really buffered us relative to the industry this year because a lot of people only get paid by trading dollars and through the vote, so an increasingly less amount of dollars that we get paid are through these MiFID II oriented firms and I think that's a good thing. And then the other side of it, if a firm's going to pay a la carte for things, I mean we know exactly what you have to pay to have what you want to get. I don't think there are many firms that came into this year that, that had that menu of options open to people with pricing. Daryl: So thinking about the future, what most gets you fired up about kind of the future of Hedgeye and the industry we're in? Obviously we're very a unique firm in terms of how we're structured, but you look forward five, ten years...I think a lot of things probably fire you up, but what do you see or think about Hedgeye that gets you really excited? Keith: Just the enlightenment, the ability to teach people a better way. I mean, I think that that's far and away, like it's importantly it's part of the thing that gets me up in the morning because it frustrates me that not everybody knows the truth. You've known me for a long time, nothing frustrates me more than people that are getting paid to pump or produce something that is just not truthful and/or consistent, transparent, and accountable. I just think that that opportunity to me, until my time has come, that's always going to be the opportunity. We're so small relative to the market opportunity in terms of taking share from the Old Wall and all these broken ways. The media itself...if I thought that Old Wall research investment banking oriented and broker-oriented research was bad. Keith: Oh boy! The media is the worst thing I've seen. Because you have a much lower level of competence from the analytical perspective. At least with a research analyst at Goldman Sachs who I'd love to hire, by the way, because they're completely competent - they're just operating in a conflicted and compromised business model, at least he knows or she knows what she's doing. She can model a company. She can tell me with 20 to 25 years of experience, maybe more, what industry trends are big and new which ones are about to be secular and bad. Politically, I don't particularly care. I'm not a Republican or a Democrat. I always like to say we're good Canadians. But, unlike that kind of media, Old Wall media gets paid for clicks, clicks, clicks, clicks, and they don't have a real political spin. They just have a spin to show you things that are making things go up or down. The most recent example is bitcoin. I don't think CNBC could have pumped that idea as being the next asset class any more than they did into poor mom and pop's home into the end of December of 2017. It's apocalyptic. How bad that was. It was probably worse in the internet bubble for CNBC because there are many more eyeballs and access points which they well know are paying attention to everything that they're pumping, so whatever that is, I think that's just got to change. The feedback that we get from our loyal subscribers or new subscribers for that matter is just that there like I am tired of losing half my money in something where I didn't know the risks. And that's always going to be the opportunity, the truth. So no matter what we build here at Hedgeye, no matter what form or shape it's in, it's always has to be principally oriented with transparent, accountable research that is forcing the truth and when we're wrong, and we realized what we thought was the truth is not true, we have to reveal that right away and be again accountable to people in that regard. Daryl: We're going to wrap it up here with a few more personal questions. Is there a book that has changed the way you think about the world, not necessarily market related, but a book that you've read recently or in the past that sort of jumps out? Keith: The fulcrum point of my process if there was a book is called The Misbehavior of Markets by Benoit Mandelbrot. I've talked about this book quite a bit so our subscribers or our community of users would definitely know what that book Is, but that, that gave me the light, if you will, shone a bright light on my academic training because I was an undergrad economics degree at Yale. Linear economics. Okay. A lot of the things that you should know but you should not use when trying to make buy and sell calls in markets. So the fractal model or fractal geometry, which is what Mandelbrot taught me in that book was a much more practitioner oriented, fundamentally based, non-linear, a foundation, if you will. That was tagging alongside of something that I had already spent a lot of time reading and studying and measuring and mapping and evaluating, which was one of the things that were born out of the Santa Fe Institute. They were talking about complexity theory, anything that has to do with nonlinearity, the element of surprise, the ability to measure and map risk using nonlinearity as an assumption. There's actually a new book called Scale, that I'm quite fond of that is written by the guy who actually ran the Santa Fe Institute in the late nineties when I'd argue they're having their most formative period, a guy by the name of Geoffrey West. But that book Scale is a great book. I've literally spent the last 15 years operating from the premise of like a more fractally oriented premise in terms of how everything I think about and everything that I modeled. This book is actually not that old, it really puts a capstone on top of a lot of the things that I already believe. Daryl: That makes a lot of sense. It gives people a good framework for how you think about things in the world. Even the business, let alone just investing. Keith: The business too is like when we think of, when I think about building Hedgeye, everybody here knows like, you know, try it, break it, you know, redo it, fail fast, these are the things that you should do. You should not operate in a beautiful box, love Tiffany as a brand, but that's not how to build a company. I mean risk doesn't happen in a beautiful box that's going to be completely predictable with nice edges around it. It's going to be rough and just like any fractal pattern and you have to be ready for that. Daryl: What is your favorite activity away from the office? Keith: That's easy. That's coaching hockey. Love coaching. Daryl: Which is a lot like managing in some ways. Keith: And I love to teach, I love seeing progress. Maybe it is a little bit like what I like to do here or a lot like it, but I love seeing kids like an age group that I coach, which is between 8 and 12 years old. You can have a tremendous amount of impact with kids. And it's also a great break from this job, this can be a little stressful when you're trying to get these darn Real-Time Alerts right all the time. Daryl: Alright, last question. When you have a bad day, lose a client, market doesn't go your way, what keeps you going? Keeps you motivated? Keith: I always, even if it's really cold, actually half the time if it's snowing it's even better, I'll go for a long run slash walk. It's becoming more of a walk as I get older than a run and I'll listen to a book as opposed to read it and I'll just get it out of me, sweat it out of me. Have a shower, just know that the best thing that I can do is wake up in the morning and take another crack at it. I have a very short memory when it comes to effectively overweighting my losses. I know I'm going to lose. I know that bad things are going to happen in my life, but I just got to get to a better place as fast as I can. So that's, that's how I think about. Daryl: Okay. I think that's a wrap. Daryl: Thank you for listening. We hope you enjoyed the first episode of our new podcast, Hedgeye: In The Arena. If you would like to see more of what we offer, visit us online at hedgeye.com. And make sure to follow us on twitter @Hedgeye. My handle is @HedgeyeDJ and Keith can always be founded @KeithMccullough. We hope you'll join us next time on December 18th when we sit down with our always outspoken Senior Macro analyst Darius Dale. For information about our investing research products and special discounts for first time subscribers. Email our customer service director Matt Moran at MMoran@hedgeye.com. Thanks for tuning in.